What to watch out for when hiring a bouncing castle or Inflatable in Ireland. Bouncing Castle Hire – Hiring a Bouncing Castle, Inflatable Slide, or Obstacle Course for a Birthday party, Holy Communion, or just a fun day at home, is the best and healthiest wholesome fun that can be had for your children and your guests. Your children are the most important thing in your life, so it stands to reason that you should pay attention to some areas regarding safety for your inflatable obstacle course, slide, or even a simple bouncy castle. Like all play, a bouncing castle can never be regarded as totally safe, because all play has risks, but there are some steps we can take to reduce those risks. the hire company is insured. In fact, if the company you are hiring your inflatable from does not have a current safety certificate for the castle slide or obstacle course they are hiring you there insurance may not be valid. As far as possible, hire your Bouncing castle from a reputable company. A reputable company should be registered, insured , and have up to date safety certificates available for you to see. 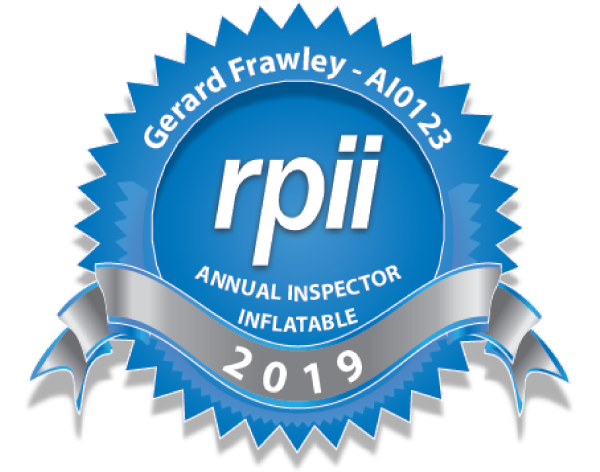 A current safety certificate should ensure that all aspects of the inflatable structure are in perfect condition and as safe as possible for your children to play on. The company you hire your inflatable from should issue you with safety instructions on how to safely operate your castle, slide or obstacle course, including all the does and don’ts. Part of the European safety standard requires your inflatable to have a clearly visible label indicating the maximum number of users and maximum height of users allowed to play on the unit. While the safety certification shows the bouncing castle, slide, obstacle course or other type of inflatable is in good order , the hire company operators should be competent and trained in how to carry out the installation of the inflatable in the safest possible manor. Before they hand over control to you they should automatically carry out their 10 daily checks. All anchorages are secure and in place. Ancillary equipment is in position eg impact absorbing mats. There are no significant holes or rips in the fabric or seams. Correct blower is been used. Air pressure is sufficient to give a firm and reliable footing. No exposed electrical parts and no wear and tear on cables. Plugs, sockets, switches etc are not damaged. Blower is positioned safely, firmly connected to the inflation tube and its mesh guards are intact. One of the most important things they should do is peg the unit down securely so it won’t blow away in the wind. Their safety instructions should tell you NEVER to use your inflatable in a wind speed more than 18 to 24 MPH or 29 to 38 km/h which is force 5 on the Beaufort Scale. They should have good sound electrical equipment with no lose or exposed wires. 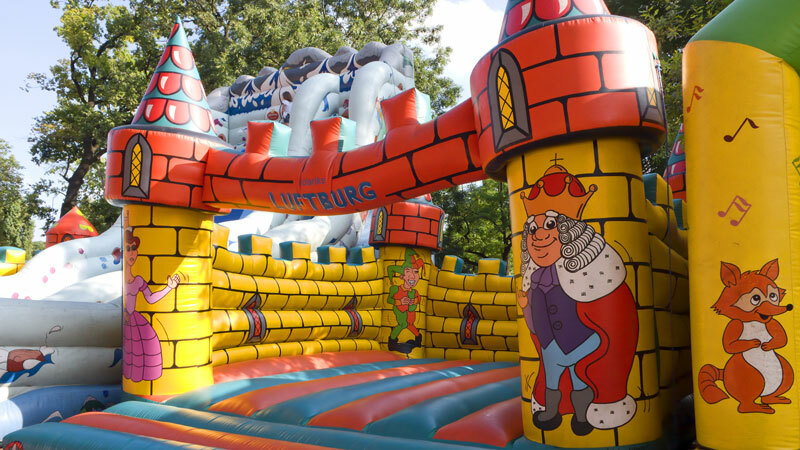 The inflatable should have a sound and reliable footing in other words be hard enough for the children to play on safely – noting worse than an old soft castle, obstacle course or slide that won’t take the load – this in fact should be considered to be dangerous. The unit should have a clearly visible label showing how many users can be on at any one time. A good inflatable hire company will give you clear written instructions on how to keep your children and guests as safe as possible. That the supervision must be constant. To admit users to the inflatable in a controlled and safe manor. To restrict users to the design height of the inflatable. To restrict the maximum number of users at one time to the design number. Users to remove footwear and hard sharp or dangerous objects from there person. Users to remove glasses were practical. One of the most dangerous activities involving a bouncing castle, slide or obstacle course is to let the children plug the unit in and out for the fun of it. This is seriously dangerous as a small child can be lifted up in the castle and thrown clear from a very big height. This should Never happen! So we can have a great day with a hired bouncy castle or other inflatable that can leave us and the children totally happy and exhausted with the very best of memories of the big day. Think. With a little bit of planning such as picking the most professional company to hire your inflatable from instead of the cheapest. Making sure that constant supervision is a priority, leaving out the alcohol for the designated supervisors until the children are gone to bed, and using common sense, we can severely reduce the risk of accidents. We owe it to them. Don’t you think so?